Use a light bulb and a balloon or foam ball, to model the seasons on earth as we orbit the sun. For classes where this activity is not to take up too much time, the teacher can demonstrate by holding the balloon/foam ball and walking around the circle. Blow up a balloon for each student, only half inflating it, so that it is as round as possible. Give each student a balloon to represent earth. 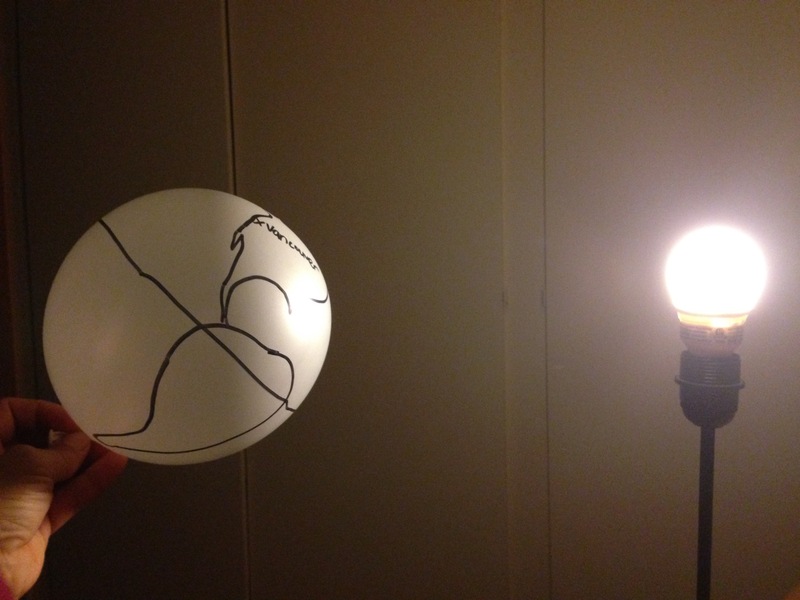 Ask students to hold the balloon with the tied neck at the bottom, then to draw on the equator with a sharpie. Then draw on a rough outline of North America, using a globe or map as a guide. Add a dot for Vancouver. Keen students can add other places that they know/are from. Place the light fixture in the centre of the room, on a desk/chair so that the bulb is near head-height for standing students. Ask the students to make a circle around the light fixture, large enough so they have good elbow room between them. Ask students to point the North Pole of their "earth" balloons towards a high feature in the room e.g. a corner. The designated feature of the room is the "Pole Star" or "North Star". With the North Pole towards the Pole Star, each earth should be tilted, ideally at an angle close to the real tilt of the earth (24 degrees from the vertical). Ask students to position their earth in front of their bodies so that the "sun" is shining on the earth, while maintaining the tilt towards the Pole Star. Ask students which is east and west on their earth. If they look at the continent of North America, it should help them. Ask students to rotate the earth in the correct direction: the sun rises in the east, so the light of the bulb should hit the east coast of North America first. They will be rotating their earths counterclockwise. For the real earth, each rotation takes one day. As the sun hits our continent it is day time and as we continue to rotate it becomes night time. Now, we will show what happens during the year, as the Earth orbits the Sun once. Ask students to walk in a circle around the "sun", always tilting their North Pole towards the Pole Star, while continually rotating their earth counterclockwise (as viewed from above). Once they have walked completely around the sun and ended up back where they started, a year has passed. Now walk through another year while asking students to keep an eye on how much sun Vancouver on their Earth receives through the year. Ask where in the circle does Vancouver get the most time in the sun? (The northern hemisphere will be tilted towards the sun at this position in the circle.) This is the position of midsummer - the summer solstice. Mark this place in the circle with "June" (on the floor, or on the wall behind the circle). This is midwinter, or the winter solstice. Mark this position with "December". It should be exactly across the circle from June. Add that the vernal (spring) and autumnal equinoxes fall between, in March and September. Now ask students to orbit the sun once more, with their tilted, rotating earths, and watch what happens to the north and south poles. Each of them get sun all day for part of the year. The sun never sets in Northern Canada in the summer as it is so close to the North Pole. Discuss seasons in the northern and southern hemispheres, especially if a child in the class is from the southern hemisphere. The combination of more direct rays of sunlight and more hours of daylight causes the hemisphere that is tilted toward the sun to receive more solar radiation and to have warmer temperatures. A common misconception is that our seasons are caused by the distance from the sun. This is not the case. Our seasons are caused by the the hours of sunlight, and the angle of the sun's rays, as described above. 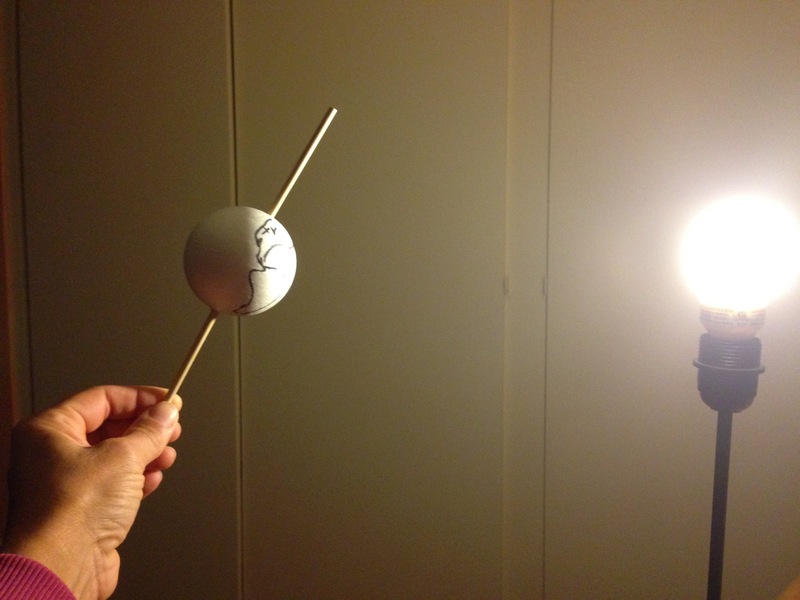 A foam ball on a skewer gives a more dramatic light and dark side of the earth, and the stick is good for holding and turning, but much more expensive.